The Harry Potter universe is filled with unique characters who have their own unique fashion. 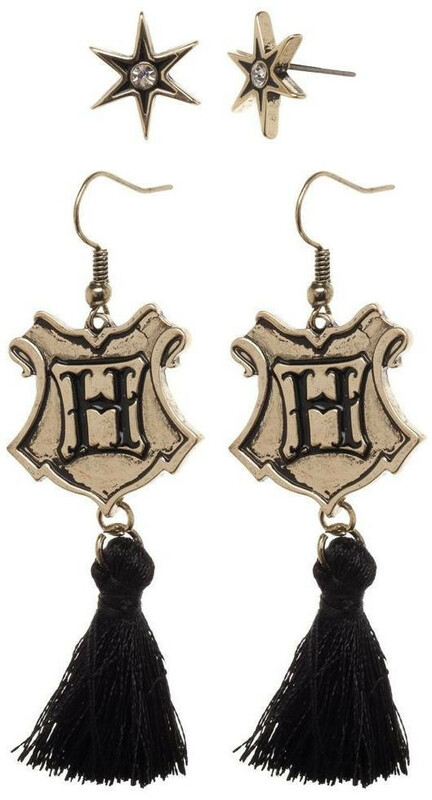 The Harry Potter earrings set includes a pair of dangle earrings with the Hogwarts Crest and black tassels hanging beneath. It's a great Harry Potter accessory for anyone who loves the series or who loves Harry Potter fashion. The set includes a pair of post earrings with the classic Harry Potter stars found in the corners of each page of the book series. The set is a great Harry Potter gift for girls. 2-pack of earrings feature 1 pair of stud and 1 pair of tassel earrings! Zinc Alloy & Nylon, one size.